Inclined shelving is an ideal solution for industrial manufacture and order picking processes. Optimise your workflows with clearly arranged workspaces and rapid access to materials and goods. Inclined shelving is an ideal solution for industrial manufacture and order picking processes. Optimise your workflows with clearly arranged workspaces and rapid access to materials and piece goods. The META drive-through rack is the perfect solution for clearly arranged, easily accessible goods and materials. The angled roller tracks provide optimum access during assembly, storage and order picking tasks. Expand your shelving systems with the single-sided META drive-through rack add-on unit. The practical boltless assembly enables quick and simple attachment to the base unit, thus saving you both time and labour. 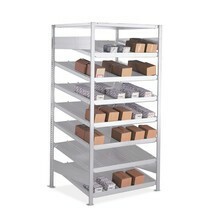 Expand your shelving systems with the double-sided META drive-through rack add-on unit. The practical boltless assembly enables quick and simple attachment to the base unit, thus saving you both time and labour. 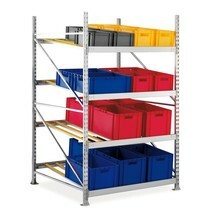 Do you use the easily accessible flow-through racks from META for the provisioning of goods and working materials? Then this add-on unit from our accessories range represents the perfect modular expansion to your shelving system. The additional level for the META drive-through rack is equipped with roller conveyors, thereby ensuring the effective and sustainable distribution for assembly and order picking. The surface is galvanised and therefore resistant to corrosion. This guide rail for the META drive-through rack with roller conveyors ensures that everything runs along the desired conveyor. With a drive-through rack, you significantly increase the efficiency and speed of your operating flows.